This sanguinary battle took place on the 5th of November, and yet it was not till the 23d that the reports of the allied commanders and of the correspondents of the leading journals reached London. Very brief accounts of the affair were brought to this country by the two recent steamers, but nothing in sufficient detail to enable us to form any satisfactory judgment on the features of the struggle. To-day, however, the mails of the Pacific enable us to furnish the most complete accounts of the whole, including the dispatches of Raglan, Canrobert and Menchikoff, with the very excellent and spirited letters of the special correspondents of The London Times[a] and The Morning Herald, both of which journals are served on the spot by writers of distinguished ability. With all these, and other documents at hand, we proceed to analyze the story of the battle, with a view to enable our readers to arrive at an impartial and intelligent opinion concerning it. Like the Prussians at Jena, the British forces facing toward Inkerman were stationed on a range of hights accessible in front by a few defiles only. Like the Prussians, the British had altogether neglected to occupy an elevation on their extreme left, on which, like Napoleon at Jena, Menchikoff threw a portion of his army there establishing himself upon the flank of the enemy before daybreak. The intention of the Russians was evidently to profit by this circumstance in order to bring the mass of their troops to bear upon the flank of the British, to deploy upon the hights thus secured, and crush the British divisions as they came up singly during the fatal but inevitable maneuver of changing their front, or to "roll them up," as it is technically called. To this maneuver Napoleon owed his brilliant success over an army which, though clumsy, slow, and badly commanded, was yet at that time the best of the old continental armies. The rapidity of his movements, ' executed with troops versed in the new mode of warfare introduced by the American war of independence, by the French revolutionary wars, and by Napoleon himself, favored this bold stroke. Here, at Inkerman, it was with slow and clumsy troops that Menchikoff attempted this same surprise upon the active and quick-moving troops of the British and French; and the result was accordingly the opposite of that at Jena. The negligence shown by the British in the manner of occupying their positions is utterly disgraceful to their commander. There is no excuse, either for the non-occupation of the knoll on the south side of [the] Chernaya, or for the absence of field-works in this important position, for the attack of which, as he well knew, many thousand Russians were concentrating. The Russians, as we have said, profited by this neglect at once, by occupying the knoll on the north end of the range, forcing the British position with heavy field artillery. The British papers say the Russians had 24- and 32-pounders in the field, but this only shows their utter ignorance of artillery matters. The transport of their own artillery from Balaklava to the trenches should have shown them that 24- and 32-pounders cannot be taken into the field, much less into a night surprise. The fact is, what they call 24- and 32-pounders were howitzers, having a caliber similar to that of the 24- and 32-pound gun, but in fact light field guns, not heavier than the British field-howitzers. The howitzer, throwing a hollow projectile with a small charge, and obtaining range by elevation chiefly, can be made of a larger bore than the cannon for solid shot. The 24-pound howitzer corresponds in weight and effect to the 6-pound gun, and the so-called 32-pound (about 6-inch) howitzers to 12-pounders; these howitzers are attached in the Russian service to the batteries of these calibers. This shows how ignorance and national vanity unite in manufacturing heroes and enhancing the glory of a nation's arms. So far, everything went in favor of the Russians. Their generalship had proved far superior to that of Lord Raglan. Their plan was excellent, and in a fair way of execution. A pivot had been secured, and the enemy's flank was turned. Immense superiority of numbers, ready to attack the long and weak line of the British at its weakest point, appeared to be a guarantee of final success. But the Russians did not yet fully know the soldiers they had to deal with. The British, surprised as they were, coolly changed their front from east to north, and met the assailing columns with a deadly fire. And now a fight began such as has not occurred in Europe since the day of Albuera, as at Albuera the stubborn bravery of the British troops had to regain, with the blood of three-fourths of their number, a battle already lost by the presumptuous stupidity of their commander[b]. It is a fact that at Inkerman there was more actual bayonet-fighting than in the whole Peninsular war, where the two bravest armies of their time combated each other for six years. From half-past six to half-past nine about 8,000 British stood the shock of a Russian army, which, according to the Russians' own statement, had at least 30,000 men engaged. The firmness with which they again and again repulsed the Russian attacks, made often with fresh troops, is above all praise, and it is doubtful whether any other troops in Europe, except the best battalions of Radetzky's army, could have done the same. This bravery, it must be said, was aided by the nature of the position. The front, toward the east, was established on hights so abrupt that they could not be forced. The knoll to the north, occupied by the Russians, was also separated from these hights by a couple of ravines, forming so many defiles leading to the English position. Every advancing column of the Russians was, therefore, exposed to the full plowing fire of the British artillery, and had to advance in close order up to the top of the hights before it could deploy. Weakened by the fire of the artillery, and, when nearer, of the musketry, the Russian columns arrived on the crest, and, before they could deploy into line, a discharge and a rush with the bayonet threw them down again. It was found, in this fight, that, at close distances, the Minié bullet has an immense superiority over the common musket bullet, whose force of penetration is barely sufficient to kill one man, while a Minié bullet often killed four or five, and had a telling effect upon the deep Russian columns. As the British divisions came up, the fight became general, and extended upon a longer front. 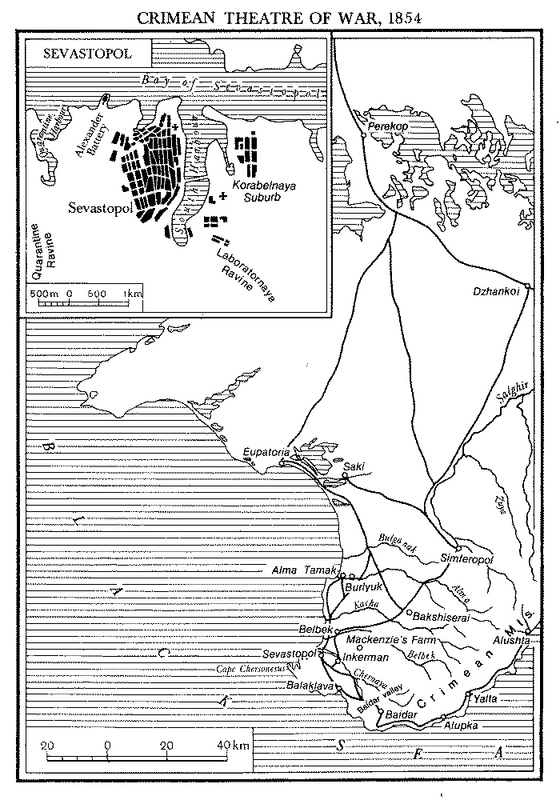 The Russians, unable to make much headway, attacked the original front of the British position with their left, while their right tried to penetrate toward Sevastopol. They succeeded, partly, in establishing themselves on the British hights, without, however, being able to form a regular line of battle. They tried to surround, and cut up, one by one, the separate small bodies of British troops. Though the struggle was hard, and the British fought wonderfully, yet they would have been crushed in this unequal contest, had not the French division of Bosquet come up. The Zouaves and the Foreign Legion charged the Russian left flank, and completely rolled it up, while the Chasseurs d'Afrique found an occasion to charge, and the Russian infantry had to retire. Thus, fourteen thousand allies, with a loss of one-third of their number, defeated thirty thousand Russians, and yet it is acknowledged that the Russians, individually, fought very well, while we have seen that their generalship, as far as the plan of attack was concerned, was far superior to that of the allies. How, then, were they beaten? It must be said that most of the troops engaged were the broken and dispirited remnants of the besiegers of Silistria, and it is certain that Dannenberg's corps, next to Osten-Sacken's late corps, is at present the worst in the Russian army. But this was not the decisive circumstance. The battle was lost, next to the bravery of the English, through the essentially Russian way in which it was conducted. It is Russian warfare which has succumbed to European warfare. And this is the characteristic feature of the battle. The Russian commander[c] begins by drawing up a very good plan of attack, borrowed from one of Napoleon's most celebrated battles (for no Russian General ever had an original thought, not even Suvoroff, whose only originality was that of direct advance). He follows this up by setting about its execution in the very best manner possible. He establishes himself on the enemy's flank. The strategical movement is completed; the tactical performance begins. And here, all at once, the scientific and learned mode of warfare, the work of western civilization, is thrown away, and the pure barbarism breaks forth. This splendid army, with its old troops, many of whom had been twenty-five years under arms, this model of parade-drill, is so clumsy, so incapable of skirmishing and fighting in small bodies, that its officers can do nothing with it but throw its heavy bulk in a single mass upon the enemy. All idea of tactical maneuvering is abandoned; advance, advance, advance, is the only thing that can be done. This dense mass of living flesh was, of course, by its very compactness, the 'best mark an artilleryman could wish for; and while the thin British lines, lying down behind the crest of the hill, were protected from fire, they plowed up the deep columns with round shot, killing them by thirties and forties at a discharge, and rained a storm of Minié bullets upon them hardly one of which could miss a target of such extent. The mere brute pressure, the weight of this mass was to break the allied lines. But here they found an opponent accustomed to that style of warfare. The British, in their Indian wars, have learned to withstand the shock of dense masses, even if of superior numbers. And, if the Russians are far above the Sikhs or Beloodshis[d], yet the troops which were accustomed to beat six or eight times their number of Sikhs or Beloodshis might well stand the attack of three times their number of Russians, as soon as the Russians adopted the tactics of the Sikhs. The Russian column, when they arrived on the top of the hill, were already broken and disordered by the fire, and another volley at fifty yards and a charge with the bayonet was sufficient to break them. Afterward, as the Russians came up more numerously, the British, like Napoleon's squares among the Mamelukes, at the Pyramids, stood among the flood of Russians surrounding them. The steadiness of forces having that full confidence in themselves which only the men of a highly civilized nation can possess, and the superiority of the armament and fire of the British, did the rest. The Russians are the worst shots of all known troops, and they showed it here, else they must have laid low every Englishman present. This was the character, and this is the significance of the battle of Inkerman. It shows that the glories of the Russian infantry are passing away. It shows that whatever progress Russia may make, the West advances at twice her rate, and that she can have no chance with western troops in an even fight, nor even with such odds as she had at Inkerman. But for the disastrous loss of the allied transports in the Black Sea we should say that this battle would be sufficient, without very gross blunders on the part of the English and French generals, to render their final success in the Crimea beyond a doubt. Of that heavy calamity we have as yet no details beyond those of a telegraphic dispatch, from London, received by our agent at Liverpool just before the Pacific sailed; we do not know whether the last vessels carried troops or only victuals and munitions, and from the silence of the telegraph we infer that they did not carry troops; but, if the large bodies of troops destined for the Crimea were lost in this storm, then, indeed, the allies have suffered a harder blow from the elements than from the enemy, and their forces before Sevastopol may be destroyed, by disease and harassing attacks, before it can be possible to send them new reenforcements. Another and a no less serious danger menaces them in the very attitude of the German powers. Austria now for the first time seems really inclined to break with the western powers and join the Czar, and all Germany will go with her. At any rate, it cannot be doubted that the moment for the war to swell into more gigantic and terrible proportions, and to wrap all Europe in its flames, is now close at hand. [a] The Times, Nos. 21906 and 21907, November 23 and 24, 1854.—Ed. This article by Engels was entered in the Notebook as "Dienstag. 28. November. Schlacht von Inkerman". When he dispatched his article to London, Engels appears to have forgotten the first two pages of the article (see Marx's letter to Engels of November 30, 1854): "By some oversight the first two pages were omitted from your splendid article of Tuesday's date. However the substance was contained in the 5 following ones, so all that suffered was the style" (see present edition, Vol. 39). That is probably why the first introductory paragraph of the article was written by Marx; however, it was heavily edited by the Tribune editors. This sentence was inserted by the Tribune editors.